Still going! Check out our CYBER MONDAY sale. ⌨️Men’s accessories starting at $9.99 ⌨️Kid’s accessories starting at $9.99 ⌨️Womens accessories starting at $24.99 ⌨️The Cree Skirt – a special low price of $99! 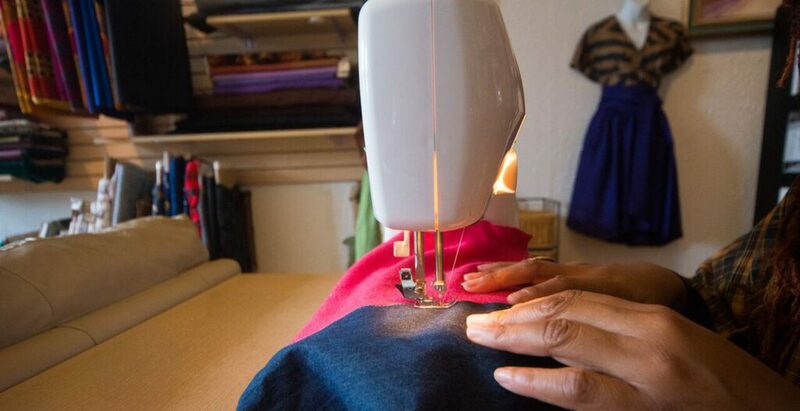 ⌨️Intro to Sewing class – save $10! ⌨️Sew, Baby, Sew – save $25! ⌨️Gift Cards – Buy one $100 gift card, get … Continue reading CYBER MONDAY DEALS START NOW! Small Business Saturday 2017: You like us! You really like us! There’s alot of work put into all pur events, but Small Business Saturday at Dru Christine Fabrics and Design is always a special time. It kicks off our holiday season and this year, we showed off our new space inside Lake Affect Studios! After a slow start, and a brief attitude adjustment, they came. They … Continue reading Small Business Saturday 2017: You like us! You really like us! Final Countdown! Small Business Saturday Open House- TOMORROW. Thank you, American Express for all the awesome goodies for our #smallbusinesssaturday Open House tomorrow. Stickers, pens, buttons and this years bag is even cuter than last years! All these are for our guests. See you tomorrow- starts at 10. #druchristine #shopsmall #lakeaffectstudios #thisiscle Continue reading Final Countdown! Small Business Saturday Open House- TOMORROW. Small Business Saturday – it’s a big thing. This is a repost from my Cool Cleveland.com column in 2016, but the message is the same for this year and beyond: “SAVE A LITTLE (or ALOT) for Small Business Saturday!” Enjoy the article and see you on the 25th! http://coolcleveland.com/2016/11/save-little-lot-small-business-saturday/ Getting ready – it’s our time of the year, Dru Continue reading Small Business Saturday – it’s a big thing. Small Business Saturday- 7 days and counting. 7 days and counting until SMALL BUSINESS SATURDAY! – It’s that time of year again. Sharing a post, checking out events and OF COURSE a purchase or two are all great ways to support. What’s your plan for the day? Continue reading Small Business Saturday- 7 days and counting.